​Located in charming Rothesay, New Brunswick, this elegant 11 suite Inn and restaurant offers genuine hospitality and ambiance steeped in east coast tradition. 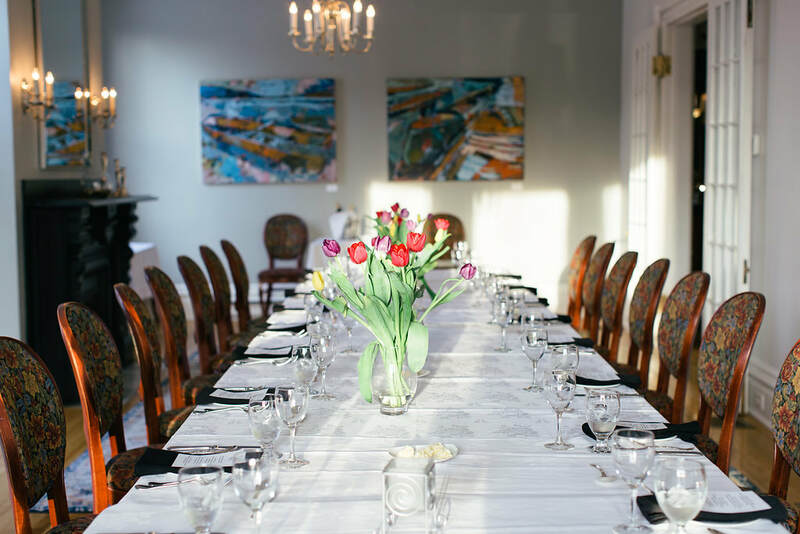 Our newly renovated Robertson Room restaurant, overlooking the side patio garden, can accommodate 40 people, while another 50 can dine in our elegant main dinning room. And we have a small, intimate dining room that suits a party of 2 to 20 people. In the summer, our beautifully hedged, private outdoor patio is very popular for long, leisurely lunches and dinner under the stars. ​Our guests can relax and enjoy a beverage, before and after dinner, in our warm and unique mahogany paneled lounge. During the summer our canopied deck, patio and manicured gardens are busy with weddings, anniversaries and business receptions. When the winter weather brings us indoors, the fun switches to a traditional Yule tide atmosphere - a popular time of year for locals and visitors to dine and celebrate at Shadow Lawn Inn. ​The Inn is located about 15 kilometers east of the City of Saint John and 10 kilometers from the Saint John Airport, near the Kennnebecasis river. The Inn has retained it's original splendor while experiencing continuous updates over the years to modernize. Decorated with a blend of vintage antiques, the guest suites offer comfortably elegant charm with modern amenities ~ welcome to the center piece of Rothesay, New Brunswick. The Inn is in close proximity to many recreational activities including the Yacht Club, Golf Courses, Beaches, Walking/Running Trails, Tennis & Racquetball Courts, Skating Rinks and more. ​The Inn was built in 1870 by James F. Robertson for twenty thousand dollars. Originally named 'Karsalie', the home has operated as an inn for over 60 years. ​King Edward VII passed through this part of Saint John in 1860 and the residents decided to name the area after his title, Duke of Cornwall and Rothesay. The tree-lined roadway that leads into the community and the beautifully maintained 19th century mansions mark Rothesay as a wealthy extension of old Saint John. ​It was here in 1870 that Mr. James F. Robertson built 'Karsalie', a stately mansion that he used as his summer home. Mr. Robertson was a founding partner and later president of MRA's (Manchester, Robertson and Allison), the largest department store in the City of Saint John. ​When Mr. Robertson passed away in 1921, the house was sold to his nephew, Percy Thomson. One change Mr. Thomson made was to rename Karsalie. Over the decades, the cedar hedges, fully grown and their shadows with those of the birch, maple, oak and elm trees that graced the lawns, were cast across the grounds. ​From this came the name 'Shadow Lawn'. It was in 1946 that Shadow Lawn began to change from a family home to an Inn. The Flemming family, who purchased the property, began to provide accommodation to seniors and offer catering services. The next owners, Willie and Jean Ward began to expand upon the original concept of catering and hospitality and created a unique and enjoyable inn. In 1986 the Inn was sold to Patrick and Margaret Gallagher. Under their guidance Shadow Lawn has evolved into one of Atlantic Canada's premier inns with international acclaim. 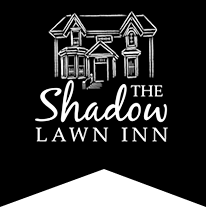 On July 1, 2010, Patrick and Margaret's son, James Gallagher and his wife Mary Ann (McGuire), became the current owners of Shadow Lawn Inn. With the help of their parents, they made gradual changes to the Inn and are attracting new visitors from all over the world. Jamie is a graduate of St. Mary’s University (BComm) and spent 13 years in corporate sales before purchasing the Inn. Mary Ann earned a Bachelor of Commerce with a major in Marketing from Mount Allison University and an MBA from St. Mary's. She then spent 6 years as a project manager before opening and operating Benjamin’s Books, an independent children’s bookstore in Rothesay for 13+ years. ​Although Jamie and Mary Ann have achieved much in business, their greatest accomplishment is ongoing; that of raising a family of 4 children: Daniel, Mac, Eliza and Nora. Experience a delicious culinary experience in the Robertson Restaurant, unwind in one of our restful Suites, or enjoy a special event or business function, all at Shadow Lawn Inn.